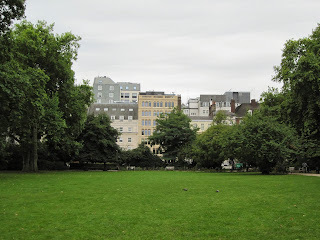 Lincoln's Inn Fields was built on the initiative of William Newton, who obtained a lease from the crown in 1629 for the property known as Cup Field. This land had previously belonged to the hospital of St. John of Jerusalem in Clerkenwell but was confiscated during the reign of Henry VIII. It was briefly reinstated during the time of Queen Mary but reverted to the crown under Elizabeth I. The adjoining land to the west, Purse Field, was obtained by Newton in 1638. The fate of this property was similar to that of Cup Field. It belonged to the Hospital of St. Giles but was confiscated in about 1537. Previous attempts to build in the area had been frustrated by government policy. A provision was made to prevent any buildings on new foundations within three miles of the city gates. Nonetheless, Newton managed to convince Charles I to give him a licence to build 32 houses, probably on the grounds that it would increase the value of the land, which still ultimately belonged to the crown. Newton had some of the houses built himself but sold most of the plots to builders. By 1641, new houses had appeared on the south and west side of Purse Field in the west. New houses in Great Queen Street was also built as part of the this development. However, Lincoln's Inn had lodged a complaint with the House of Commons and further construction was not allowed to proceed. Newton tried to appeal, but the matter was left unresolved when the civil war broke out in 1642. The north side of Purse Field was completed in 1653-57. The land had by this time passed from William's brother, Humphrey Newton, to Arthur Newman. The north and south sides of Cup Field, on the other hand, were acquired by William and James Cowper and Robert Henley. The remaining plots were built up in 1658-59. 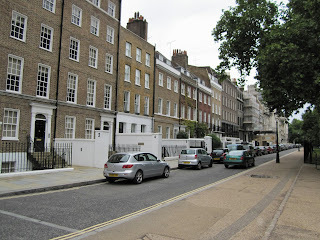 The surrounding streets were named Newman's Row, Arch Row and Portugal Row. Despite the relative uniformity of elevations, there is no record of a binding clause, in Newton's lease agreement with the crown nor in the contracts he made with developers of the individual plots. It is assumed that conformity came as a result of voluntary agreement. A plan to build a church in the middle of the Fields were proposed in 1699 by Cavendish Weedon, with a church design by Christopher Wren. The plans were never carried out. The building known as Lindsey House (59-60 Lincoln's Inn Fields) was built in 1640 and is the only remaining of the original facades. It was long thought to have been built for the earl of Lindsey, but is more likely to have been built on a speculative basis by David Cunningham. The design has been attributed to Inigo Jones, but there is no evidence of this. The elevation is in stone and brick, with a portion of the cornice in wood, but the brick has since been stuccoed over. The house was divided into two in 1751-52, a party wall was driven through the property and a new double entrance was created. Other alterations to the facade include the missing female bust on the central pediment and the lowering of the first floor windows. These were previously aligned with the pilasters and did not dip below the pedestals. 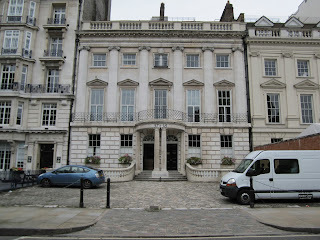 The adjacent house (57-58 Lincoln's Inn Fields) has a very similar facade, but this is not the original. It was built for Charles Talbot circa 1730 by the architect Henry Joynes. The work was criticised at the time for breaking the symmetry of the row. Previously, Lindsey House had been the tallest structure, with adjoining houses to the south and north slightly lower and the row's remaining houses slightly lower still. Talbot's rebuild, however, is taller than Lindsey House. The entrance was altered in about 1795 when the house was divided into two and a party wall was driven through the property. The portico was designed by John Soane. The original house was built in 1639-40 by Edward Bellingham. To the left stands Queen's House, and at the corner of Sardinia Street the LSE New Academic Building. Both were built as part of the Kingsway development in the early 20th century. Queen's House was built by architect M.E. Collins in 1913-14, while the New Academic Building was built as offices for the Public Trustees in 1912-15. It has previously been known as Stewart House and was designed by architect Henry Tanner. The previous houses, five in total, were built by John Gorst and David Murray, in a style similar to Lindsey House. The elevations were mainly in brick, with ionic pilasters, and stone in capitals and bases. The pilasters were decorated with Tudor roses and fleur-de-lis. A provision was made in the respective sales agreements with Gorst and Murray that an archway should be built under the houses to provide access to Princes Street. All the houses survived until the 20th century except for 56 Lincoln's Inn Fields, which had been replaced with a plain brick facade. The door case was constructed in wood with Ionic columns supporting a broken pediment. The remaining four houses had suffered various alterations, such as projecting bay windows, partial reconstruction after fire and plain attic storeys. The building adjoining Lindsey House to the north was demolished in 1746-49 and replaced with two new houses with plain brick and stucco facades. These were pulled down in 1910 and a new building was erected, probably to the design of architect Paul Hoffman. But the current building is from about 1980 and is not much taller than Lindsey House. The next building is one of the earliest reinforced concrete buildings in London. It was designed by architect William Simmons and was completed in 1886-88. The facade of 64 Lincoln's Inn Fields has pilasters and is vaguely similar to Lindsey House. However, the stuccoed front is from the early 19th century. 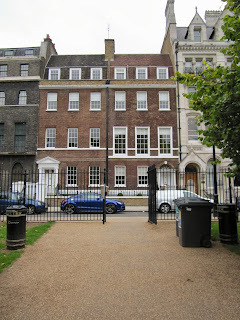 The narrow frontage of 65 Lincoln's Inn Fields is a bit older and was completed in 1772. The architect for this is recorded as a Mr. Leverton. 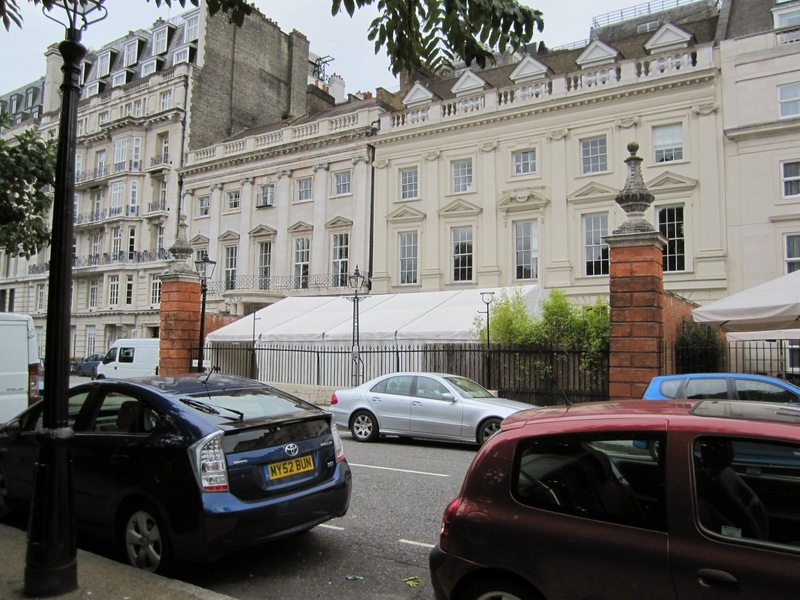 The large mansion on the corner is Newcastle House, formerly known as Powis House. The original building was destroyed in a fire in 1684, and a new house was built to the design of William Winde. The owner at the time was the earl of Powis who had to leave the country after the downfall of James II. The house, still not entirely finished, narrowly escaped being destroyed by a mob and was selected as the official residence of the keepers of the great seal. Works were subsequently carried out according to instructions by Christopher Wren. 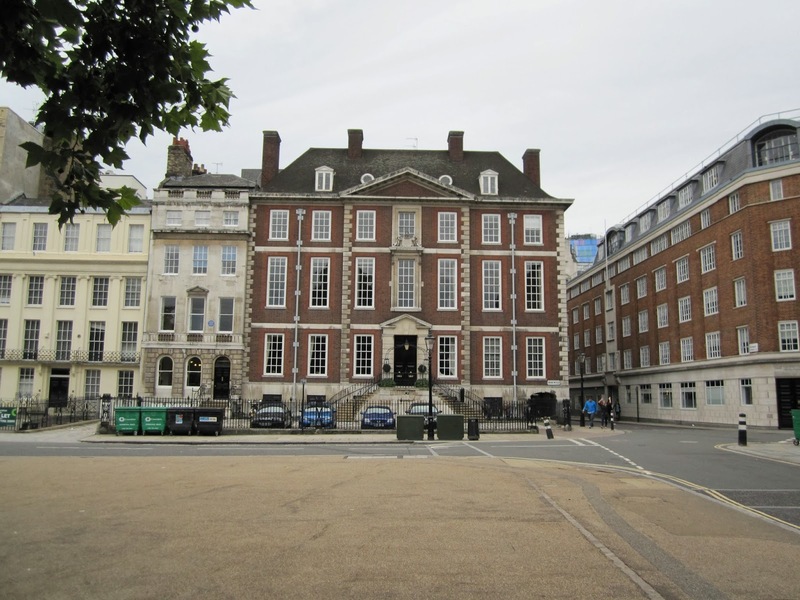 In 1705 the house passed to the dukes of Newcastle and the keepers of the great seal moved to 51-52 Lincoln's Inn Fields. Alterations were subsequently made by John Vanbrugh. The house was divided into two parts in about 1771 and the facade suffered further changes. However, in 1906 the two parts were reunited into one and in 1930-31 the original facade was restored by Edwin Lutyens and Dendy Watney. On the north side, most of the buildings are from the 18th century and none of the originals remain. Numbers 1 to 12 were all built by Arthur Newman in 1653-57. The remaining houses to the east were only built after an agreement was reached in 1657 between the Society of Lincoln's Inn and William Cowper, Robert Henley and James Cowper. Numbers 12-14 were united into one by John Soane and is today a museum. Number 12 was purchased by the architect in 1792 and the two other houses were pulled down and rebuilt by Soane in the period up to 1824. Numbers 15-16 are more typical 18th century houses. Number 15 was probably built around 1742 and has a doorcase with ionic columns and a pediment. The building on the right (17-18 Lincoln's Inn Fields) was completed in 1872 by Alfred Waterhouse.